Children in our culture are exposed to fairy tales at a young age. Even for those of us who determine when our children are infants that we won’t flood their brains with Disney, it is a difficult resolution to stick to. For one thing, most young parents have good feelings towards the Disney movies they grew up watching. I know I loved Cinderella and Beauty and the Beast from the moment I was introduced to those films. Another difficulty is those dang princesses and talking cars are everywhere. Is there anywhere you can go without running into them? No, not even church, in our case. And even if you have decided to eschew all things Disney and have stuck to your guns, most of your children’s friends probably haven’t. Maybe if you’re Amish, these difficulties all sound like lame excuses. Maybe they really are mere excuses because, yes, we have allowed our children to become Disney fans. We ourselves are casual Disney fans. I thoroughly enjoy Tangled and laugh heartily at The Emperor’s New Groove. In the last few weeks, we introduced our 2-year-old son to Cars. But I’d like to think we’re cautious and critical fans. One of my concerns amidst the Disney Princess craze is that I intentionally give our 4-year-old daughter, Ella, a good dose of what real womanhood looks like–you know, “This broom Is FOREVER, not just until you meet a guy” and that sort of hard hitting truth. Because the reality is, with or without Disney, fairy tales are hard to ignore. There’s a reason they’ve been around for centuries, and the reason isn’t the toy market. The reason is that they are appealing, generation after generation. For whatever reason, we are drawn to them and we delight in passing them on to our children. So how can we help our children embrace the magic without buying into the (expensive) fairy tale culture? Believe me, I’m still trying to figure that out. One thing I have found useful is to own some good children’s fairy tale books. I think these books should be ones with beautiful illustrations that capture the imagination, but also tell the story in a meaningful way. I don’t think all stories should be morality stories, but most fairy tales are already set up that way. There are some pretty deep values to be found in fairy tales. Which books you choose will largely depend on your children’s age. 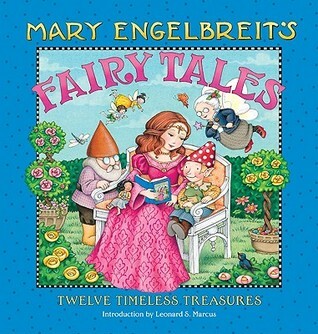 My favorite book for little girls so far is Mary Engelbreit’s Fairy Tales: Twelve Timeless Treasures. I love how the characters in this book look like young maidens, not even close to the Barbie type heroines we often see (I’m looking at you, Jasmine and Ariel!). I also appreciate how several of the stories, such as The Little Mermaid, stick with the original endings. You see, Disney’s Ariel should not have been rewarded for selling her soul to a devilish creature or disregarding her father’s orders. Hans Christian Andersen would have been revolted! The Little Mermaid ends as sea foam in the original. In Engelbreit’s version, The Little Mermaid refuses to follow the dark path she has started on and sacrifices her future with her prince. In Engelbreit’s The Princess and the Frog, the prince and princess are children, and they become friends at the end of the story instead of spouses. Thank you for that shout out to friendship, Mrs. Engelbreit! As you can see, I’m a big fan of this book. There are also other princess stories that haven’t become mainstream but hold just as much potential as the more popular ones. On Ella’s 4th birthday, we took her to see her ballet studio’s performance of This Is Love, an adaptation of Andersen’s The Wild Swans. We were spellbound by the way the ballet showed Eliza’s struggle with the wicked queen and then watched her suffering through what she knew was the way to redeem her sisters (brothers, in the original). The ballet version went into much added depth with the redemption story, and I loved it. 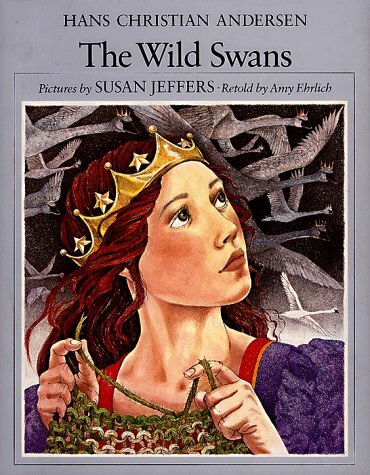 The book version I love is illustrated by Susan Jeffers. I’d recommend it for older children, as it’s a bit graphic. King Grisly-Beard is a Brothers Grimm tale and tells the story of a haughty princess who thinks she is above every suitor her father sends her way. Obviously, she must learn a lesson. Through her banishment from the princess life, she learns about humility and love and what really matters, and she also learns to appreciate the good things in life. Illustrated by Maurice Sendak, this book is a refreshing change from the usual fairy tale style. And be sure to check out The Pigkeeper. I’d like to see anyone turn that into a Disney film. Beyond the books, we still have work to do in helping our children embrace good and filter out what isn’t good in the seemingly innocent entertainment that surrounds them. For starters, we need to be there with them while they watch or read fairy tales. We as parents or loving adults in their lives need to be ready to answer questions and temper the magic with reality (just temper the magic though, not squash it). We need to teach them that hard work is valuable, whether there’s a prince waiting in the wings or not. Ella wears princess dresses daily. I don’t think this is necessarily a bad thing. (And it’s adorable). Still, I’m struggling to find a balance for her. I know that children learn the most by example and that as long as I’m not treating myself like a princess, she probably won’t expect the royal treatment either. But I still feel uneasy about what is on a pedestal in my little girl’s world. So I’m trying to choose her entertainment carefully and searching for ways to point her to kindness and loving service as the ultimate goal. She’ll learn pretty quickly as she approaches adulthood that becoming a princess isn’t going to happen. My goal for her is that she will have already seen what is really valuable and those fairy tale riches won’t even be on her wishlist anymore. I’d love to hear how you approach this with your children. Share your ideas in the comments. Thanks! This is Day 10 in the 31 Days of Picture Books series. To read the rest of the posts, go here. Next post Pilgrims or Indians?